Can i drink the tap water in Cologne? Do you know enough about the Tap Water in Cologne? Germany is generally considered an environmentally progressive nation. In fact, it is one of the European countries that are most committed to recycling. In addition to this the tap water treatment is of the highest standard with clean healthy tap water as a result. Therefore, you might assume that Germans would prefer tap water to bottled water. Strangely, this isn’t necessarily the case. In this blog we will provide an overview of the the tap water in the Cologne area and why many people prefer bottled water over tap water. We will also explore tap water contaminants such as lead, microplastics and THMs and why it might be good to use a water filter in Cologne. 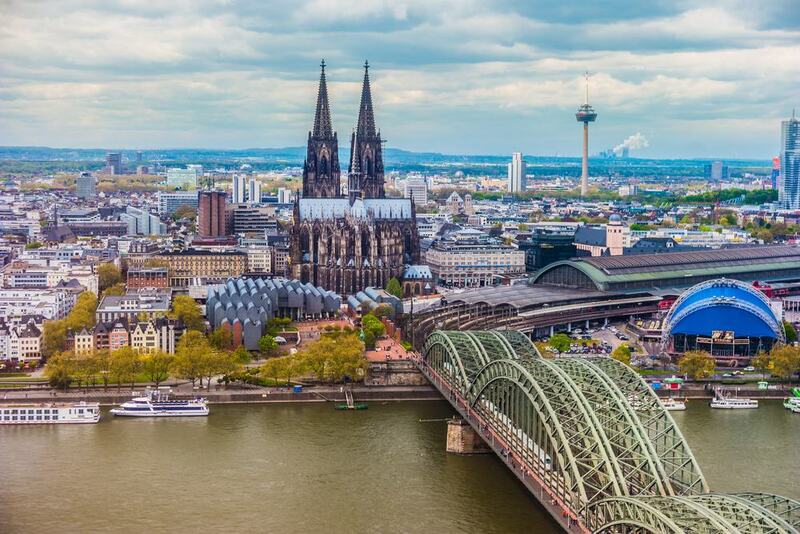 According to official information, the Cologne water treatment facilitates have particularly favorable conditions for the supply of high-quality drinking water. A steady stream of groundwater, fed by seepage and surface water, runs through the subsoil of Cologne Bay. During the soil passage and the subsequent flow through the mighty gravel and sand deposits, the water is naturally filtered. Before the water reaches the wells, it goes through several stages. It comes from the layers of the Rhine Valley. In addition to that, the water is naturally filtered and cleaned by microorganisms. After this it’s treated and tested and sent into the water supply network. Rheinenergie supplies Cologne, Pulheim and Frechen with drinking water. The supply is ensured by eight waterworks and two separate drinking water networks (left and right bank of the Rhine). The groundwater flow is fed by the abundant and abundant rainfall in the region with no negative impact on the water supply. Read more. Thanks to the relatively clean source the required water treatment is less than usual. Primarily the filtering process includes giant activated carbon filters in tanks with a capacity of 100 to 200 cubic meters. In addition to this chlorine is used to deter the potential increase in the number of germs. Is Cologne Tap Water Clean and Drinkable? Yes, the tap water in Cologne is generally clean and considered drinkable since it is regulated according to strict standards. The central body of regulations when it comes to drinking water is represented by the German Drinking Water Ordinance. The Drinking Water Regulation also requires continuous monitoring of contaminants that may end up in the tap water. What you can immediately see is that the tap water contains nitrates. It’s below the „safe limit“ but probably not advisable for babies and people with weak immune systems. This is a common problem across Germany due to the use of fertilisers in farming. But clean tap water from the water supplier doesn’t necessarily mean that it’s clean in your kitchen. In many cases, harmful substances enter the drinking water due to faulty domestic installations, old fittings or bacteria infestation. Over 20,000 analyzed water samples provide a picture of the state of drinking water in German households. On average, every 5th water sample (21.54%) exceeded the limit value according to the TrinkwV 2001. Furthermore not all water contaminants are tested for. Microplastics recently found in most bottled and tap water worldwide is currently not included in the local tests. PFAS found in the Venito region a couple of years ago is also not included in the standard tests. What Do Locals Say about Cologne Tap Water? As it is the case with most European cities, the opinions of the locals is mixed. Some of the locals in Cologne actually prefer drinking tap water as opposed to bottled water, acknowledging that it goes through more tests making it safer. Other people are concerned about water quality, specifically if they live in older houses. Hence, if you’re living (or temporarily staying) in an older house, perhaps it could be a good idea to have the water tested or look for a trustworthy water filter in Cologne. This is why there are also many Germans that would much rather choose bottled water instead. How Can I Test If My Water Is Safe to Drink? If you want to be 100 percent sure that the Cologne tap water coming out of your tap is high quality, then have it tested. This can easily be done at a specialized laboratory in your area. What about Bottled Water in Cologne? There are numerous German manufacturers of bottled water, and most locals prefer mineral water over its counterparts. In fact, there are roughly more than 500 different brands of mineral water, whereas the price per liter ranges from 0.20 to 0.70 euros. Nonetheless, it’s worth pointing out that the actual price of bottled water isn’t a legit indicator of its mineral component or anything of the kind. It is rather about the brand and its reputation. So, one of the reasons why Germans prefer bottled water instead of tap water is the fact that mineral water is promoted as being healthy. Also, many choose sparkling water instead of still water because they assume that mineral water is more nutritious and beneficial. In contrast with other European countries, Germany has an excellent recycling system, as you can recycle most plastic bottles at almost every supermarket. Despite this fact, the production of plastic still has a harmful impact on the environment – and in reality, less than 20% of that plastic is actually recycled into new bottles. Furthermore, the process of manufacturing plastic, waste management, and its transportation will release a fair amount of CO2 into the air. This is obviously not good for the environment in the slightest. When you’re thinking about environmental sustainability, it’s best to consider drinking tap water in Cologne. Is Bottled Water Healthier than Tap Water in Cologne? No, if you were to research this topic, you would find out that bottled water isn’t healthier or more nutritious than tap water. So, from this point of view, there aren’t any specific differences. Read our longer blog on this topic. Do I need a water filter in Cologne? Healthy adults can drink the tap water in Cologne as it is. But if you’re concerned about the health impact of microplastics and other recently found contaminants then using an affordable water filter in Cologne can be good. The same thing is true if young have young children. TAPP Water filters sold in Cologne are specifically tested for this kind of water. Should Tourists Drink Bottled Water or Tap Water? Considering that Cologne tap water is safe, we advise you to choose tap water, in order to avoid polluting the planet with plastic (or unnecessary glass). Cologne tap water is safe to drink, being regulated by strict safety standards. Bottled water isn’t healthier than tap water in Cologne. However, most locals prefer bottled water based on their preferences. Also, they believe the rumors saying that sparkling water is more nutritious. If you have young children or are concerned about the water quality then it might be a good idea to use an affordable water filter in Cologne.